While Riley is still little, I've been taking full advantage of picking out all her clothes and even her costumes for her to wear. In a few more years, she will have her own tastes and opinions on what she wears and I will no longer be able to treat her like my own little doll! Whether you are looking for Halloween costumes, Christmas costumes, something to wear for a party or to just play dress up with, Star Costumes has a wide variety of fun, affordable costumes for every member of the family! I was a total Mickey fanatic growing up, and so I just couldn't resist the adorable Minnie Mouse Toddler Costume I saw at Star Costumes. 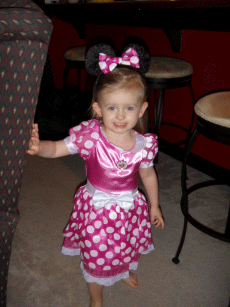 Keep reading to see Riley dressed up as the modern-day Minnie! I reviewed the Minnie Mouse Toddler Costume from Star Costumes, which retails for $48.35, but is currently on sale for $43.95. 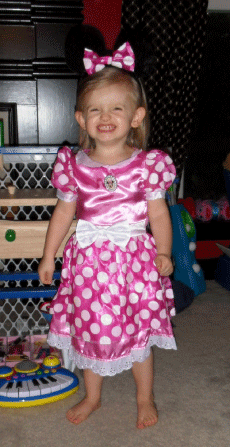 I was very pleased with the adorable pink and white polka-dotted dress and Minnie Mouse ears included with the Minnie Mouse Toddler Costume! This costume has such great details, such as the dual-layered dress and the sheer polka-dotted puffy sleeves. The iridescent and glittery material that accented the belt, collar, and cuffs of the sleeves added the perfect touch too. Of course, you can't be Minnie Mouse without the trademark mouse ears and pink and white polka-dotted hair bow! 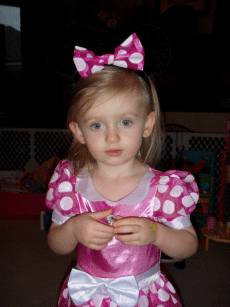 Thankfully, this costume from Star Costumes came with a soft black Minnie Mouse headband. Riley normally doesn't like anything in her hair, but she didn't seem to mind wearing the headband. I also thought that the Minnie Mouse brooch was a wonderful accent too! Riley couldn't stop looking at it and you could tell that this was probably her favorite part of the costume. The only things I noticed about this costume which could use a little improving upon were that it was a little difficult to get on and off. Toddlers are notorious for being impatient when trying to dress them and the Minnie Mouse dress was kind of tight through the sleeves. This got Riley very riled up when it came to taking the dress back off. The headband also didn't stay very well on her head and kept slipping off after only a few seconds. I believe that with a few hair clips though, I can adequately secure the Minnie Mouse ears to Riley's head. Finally, there is a lot of glitter on this costume, which is fine as long as they are primarily wearing the costume outside. Otherwise, just know that both your house and your child will be wearing plenty of glitter before too long. Here's my favorite shot of my little Minnie! The things I mentioned above though, are just small annoyances and in no way should deter you from purchasing this Minnie Mouse costume, for your little girl will look absolutely gorgeous in it! I love the attention to detail and how well the dress fit Riley. This is by far my favorite costume that she's ever worn and I highly recommend Star Costumes anytime you are looking for a high-quality costume for you or your family! 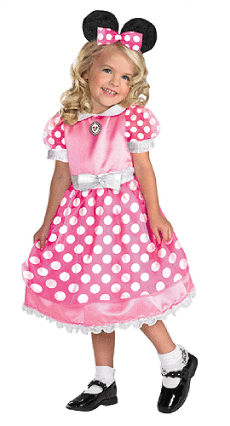 Disclosure: I received the Minnie Mouse Toddler Costume from Star Costumes in order to facilitate my review. No other compensation was received. This product review is based on my own personal experiences with this item and is completely honest and objective.